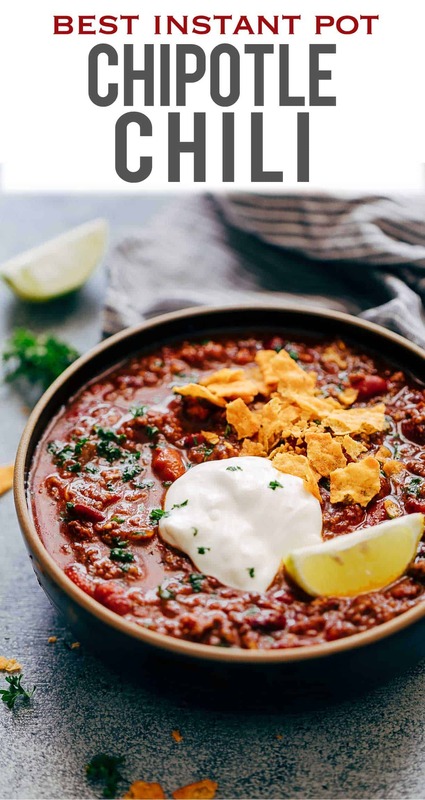 Instant Pot Chipotle Chili is the easiest and fastest way to make chili at home. It’s spicy, homemade, comfort food that will keep you warm and makes for a great one pot family dinner. Leftovers taste even better the next day! This right here is the BEST thing I’ve eaten last week and I’m seriously excited to have you guys try it. I’ve been trying out a ton of things in my Instant Pot after the amazing Thai Carrot Ginger Soup that I shared a few weeks ago, and this Instant Pot Chipotle Chili is seriously topping the list. Because this is true winter food. And I ate it at 5PM, 9PM and the next day for lunch. And I was heartbroken when it got over. Confession: I’ve never had real chili before, and I started like any of us do – by googling the internet for chili recipes and there were so many fantastic ones, but most of them seemed a bit lacking in flavour. I’m a huge chipotle lover, because I find that chipotle peppers add a fantastic spice and smokiness to food that just screams comfort and homemade and yes please! So I started by turning a basic recipe into my own version of the best Instant Pot Chipotle Chili that really blew us away! After I made this version in a pressure cooker, I also made one on the stovetop and couldn’t really see any difference in flavour, except that the Instant Pot or Pressure Cooker chili was faster – much faster! I’m still an Instant Pot noob but I have to share some tips here that I couldn’t find anywhere when I was doing my research about Instant Pots. I know everyone has their own version of homemade chili. For example, the cincinnati chili has a lot of spices and is served with pasta; some chilis are sans beans and some are more soupy. This Instant Pot Chipotle Chili is spicy, thick and tastes best as is. I add a few crushed nachos, some sour cream and a squirt of lime juice and we are all set to enjoy the best chili made so quickly in a pressure cooker. Saute: Switch on the saute function on your Instant Pot and heat oil. Once the oil is hot, add the ground beef and saute the meat for a 2-3 minutes. Work in batches to brown the meat. Spoon off any extra fat. Add the onions and garlic and saute for another 2-3 minutes. Pressure Cook: Add the chipotle powder, chili powder, oregano, cumin powder, chipotle chillies, pasta sauce, drained kidney beans, water (or broth) and salt. Mix well, close the lid and turn the valve to sealing. Use the manual setting to cook the chili for 30 minutes. After 30 minutes let the pressure release naturally. Serve: I like to let the chili sit for an hour and then reheating it before serving. But you can always serve it immediately topped with your favourite toppings! If I double the recipe, do I double the time in the instant Pot? No you don’t have to double the time. When you double the recipe, the IP will just take slightly longer to come to pressure. So delicious. Had a good chilli hit and lovely depth of flavour. Will definitely be making this again. Thank you for this chili recipe. I have been wanting to make something really easy for dinner, but I didn’t know what I should make. I’m glad that this can be made in an instant pot or a pressure cooker. That makes things really easy and faster. I’m glad you mentioned to use dried beans and soak them the night before. I will have to give this a try! I hope you like it Deb! Can this recipe be doubled? Any changes to the cook time needed? Looks delicious! Love the addition of chipotle. This is only way we cook chili at our house. Made a batch using your recipe with one slight change. We can’t get Chipotle Chillies in Adobo Sauce here. We instead used 2 fresh Bird’s Eye chilies, chopped roughly and a touch of tomato paste. It turned out fantastic. I JUST got an instant pot – this is going to be one of the first recipes I try 😀 Really appreciate all the tips, too – I’m going to need them! Thanks Chrisy! Love my Instant Pot! I’m an instant pot newbie so I’m on the hunt for great recipes like this- thank you! I love chipotle flavor too- that smokiness is amazing! This chili is on the list for next week! Thanks Jessica – I’m all for chipotle in everything!